This card is for two different challenges over at Splitcoast today – one is the Hope You Can Cling To Challenge – only use paper on your card, no bling, no ribbon. The other is the Color Challenge – More Mustard, Soft Suede, Tangerine Tango, and for dessert – Thanksgiving. In case you’re not familiar with the Hope You Can Cling To Challenge – it’s in support of breast cancer and our cards will be headed to Houston to the UT MD Anderson Cancer Center for breast cancer patients and their families. I was fortunate enough to spend some time in Minneapolis last month and made a trip to Archiver’s – a paper crafting junkie’s heaven LOL!! The McGill Paper Blossoms punches make a variety of flowers and that was ONE of my purchases. My sunflower has been made with the McGill punches, the molding mat and tools. After punching all the required shapes, I edged the sunflower petals in Soft Suede. The leaves were also edged in Always Artichoke. Next using the molding mat and a stylus the paper fibers are broken up to allow you to manipulate the paper better. Then you shape the leaves and petals and finally attach them all. The sentiment has been stamped on a tag and tucked in just behind the sunflower. 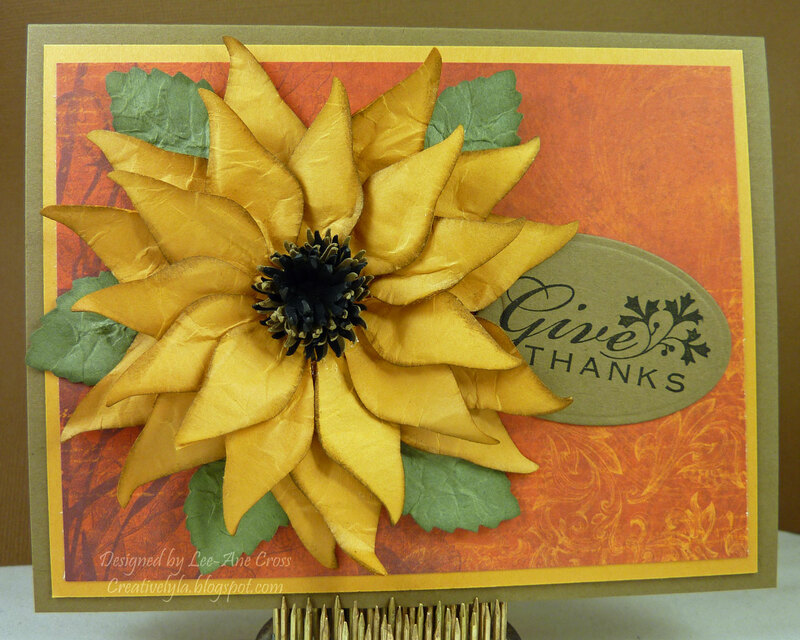 Accessories: McGill Paper Blossoms punches: Star Lily, Large Highland Snowflake, Sun and Birch Leaf; McGill Molding Mat and Tool Kit; non-stick craft mat, paper snips, Colorbox Stylus and sponge tips and Crafter’s Pick Ultimate Glue; Big Shot Pro and Spellbinders tags. This card is SOOO fabulous!!! I just saw it on Splitcoaststampers and followed your link to here. Wow, even without “bling” it makes more of a statement. Love it! !